Everyone love easy and tasty scones. Good for school lunch as well. Preheat oven to 180c. Sift flours and baking powder. Combine flours, baking powder, sugar and salt in the bowl. Add the butter into the bowl. Rub and mix quickly with your fingers. Add chocolate into the bowl and mix with wooden spoon. Roll the dough out to 2cm thick and cut with sharp knife or mould. Place them on a baking tray lined with baking paper. Bake for 15-18 minutes or until surface is slightly browned. Notes... If you have time, wrap the dough and rest in fridge 30-60 minutes before rolling. You can use chocolate block (cut into small bite size) or choc chip instead of choc chunks. These look so good – I love the use of chocolate! I love a scone but had never thought of a choc chip version. Yum! I’ve never thought to change the taste or texture or scones, great idea! 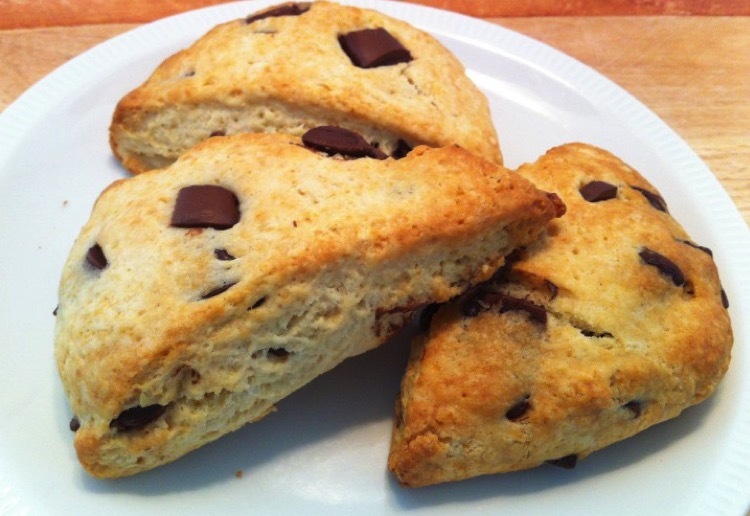 Im sitting here with a cup of tea … wishing i had some of these scones right now ! Hopefully the batch I make will look like yours. Thanks for the recipe. Oh my goodness, these look AMAZING. I only wish I could make the Gluten Free (and so they taste as good) So jealous right now. Scones and chocolate! Two of my favourite things. A nice variation – almost like a chocolate croissant. This look amazing and ready to be eaten. Looks yum but to be honest I prefer my scones plain!